Longview Power LLC, the company behind one of the newest and most efficient coal-fired power plants in the U.S., is seeking investors to help make the plant part of a diversified energy complex with new solar and natural gas facilities just outside of Morgantown, W.Va.
Longview Power LLC models the potential solar and natural gas power facilities it is looking to locate adjacent to its advanced supercritical coal-fired power plant outside Morgantown, W.Va.
"We see in this marketplace a need for other advanced, highly modern energy generation from other types of fuel and matching that up with what we have got here at the coal plant," Keffer said. "The marketplace is changing. We've always got to be adjusting. All the electricity generators in this country need to be adjusting, and there's not one answer." The power generator, built in late 2011, originally supplied its own coal from an adjacent coal mine. However, that became increasingly costly, and the plant now sources its coal from a nearby longwall mine another company operates. With its coal mining property and the current power generation site, Longview already has the land it needs for the new project. The company said it also has rights of way for gas pipelines and has initiated the interconnection and permitting process for the new solar and gas assets. Existing infrastructure makes the project "very developable," Longview COO Steve Nelson said, lowering the risk of development and construction usually associated with a new facility. The facilities are being targeted for completion by late 2022 or early 2023, Nelson said. "What we're trying to do is get the very best technology situated on top of the resources, and it is centrally located in North America's best market," Nelson said. "At the end of the day, we don't see ourselves as a coal-fired generation service supplier. We just see this overall as a responsible and viable business decision to diversify our fuel supply and the type of electricity product we're going to offer." 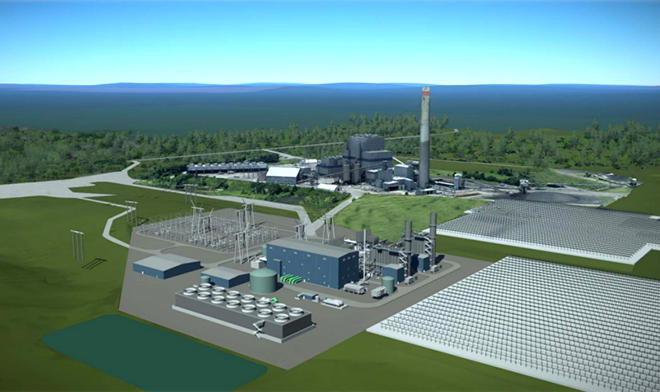 The additional facilities would provide increased revenue and provide a "natural hedge" for a company now operating only a single coal plant. So far, unlike many of the older coal plants in the region, Longview's coal facility has proved to be a workhorse in a market that has seen more coal plant retirements than success stories in recent years. "You hear all the time about coal being resilient and needed for baseload," Keffer said. "Well, the economics for these older coal plants isn't demonstrating that anymore, but we are." Market forces will continue to drive the retirement of "older, antiquated plants" in the region, Keffer predicted. Meanwhile, the rise of gas generation capacity is consuming more of the fuel and could put pressure on the recent trend of lower-cost natural gas. Solar will be a useful supplement to Longview's power generation, he said, but at the same time, a 17% availability factor in the area means it is "not going to keep the lights on and the heat on in the middle of the winter." "Our energy generation, our electricity system really needs an all-of-the-above approach," Keffer said. "Those pushing on one or another — either preserving very aged and antiquated plants that are costly or those that believe the answer is all renewables — are missing the boat in terms of making sure we have resilient and dependable energy."